Lately, I've noticed my kids are just totally ungrateful for the blessings that they have in their lives. I know this isn't an uncommon phenomenon in our culture, but I really want them to be thankful for all that we have - so I'm working on a strategy to help them see that they have it pretty darn good. In school, we've been talking about praying for others and being thankful for the things that we have. With November coming up -- I remembered something I saw last year, by the time I saw it though - they were sold out of their inventory. 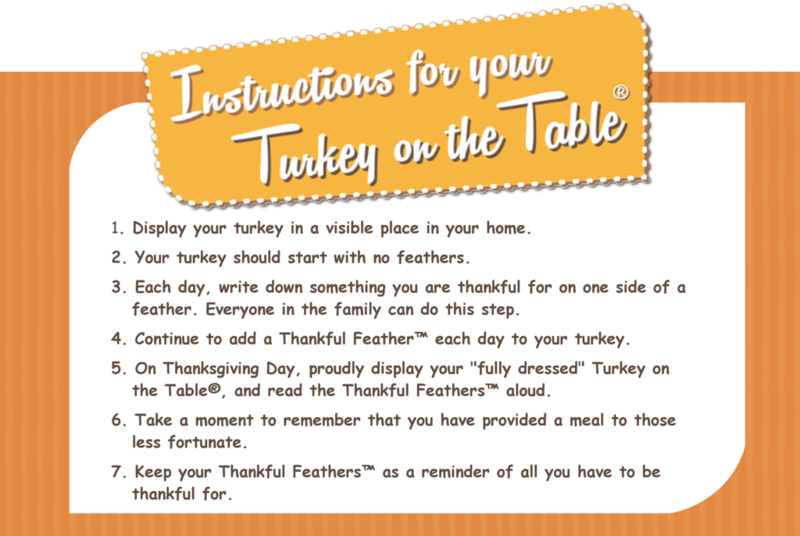 Not only will your family experience the benefits of being thankful, you will also experience the joy of giving, knowing that 10 meals will be provided to someone in need with each Turkey on the Table® sold. 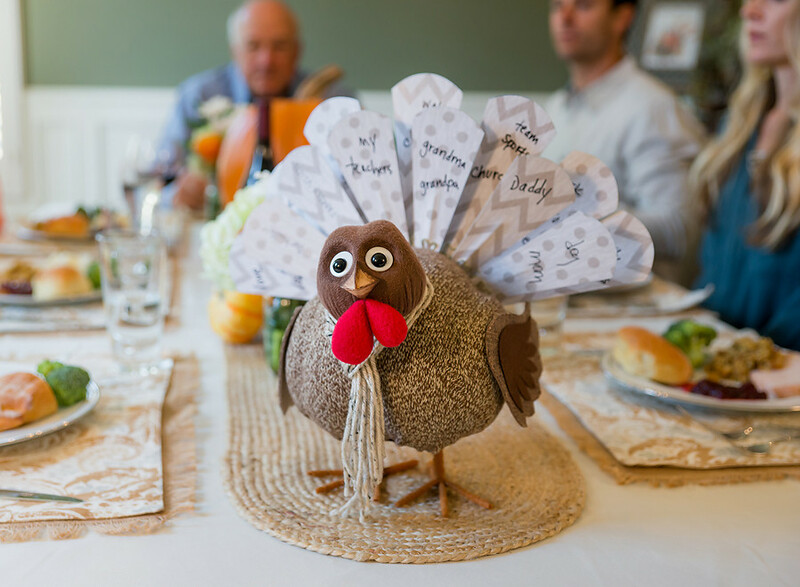 To date, over 102,000 meals have been donated by Turkey on the Table® through our partnership with Feeding America® . I absolutely love that they've combined the program with giving back to give meals to those in need. I can't imagine a better learning lesson than to talk to the kids about how some people don't know where their next meal will come from. I've looked into taking them to pack lunches for school kids that can't provide their own - it's a sack lunch program for needy children in our area - but they aren't old enough yet to go help with packing them. So, we're going to try this - I love that when it comes time to do it again - you can just get new feathers from them in all sorts of different styles. We will start it on November 1st, and go until the end of the month. I'll read them the book in school on November 1st, and set him out on the kitchen table -- then we will add to him every night when they're having dinner. 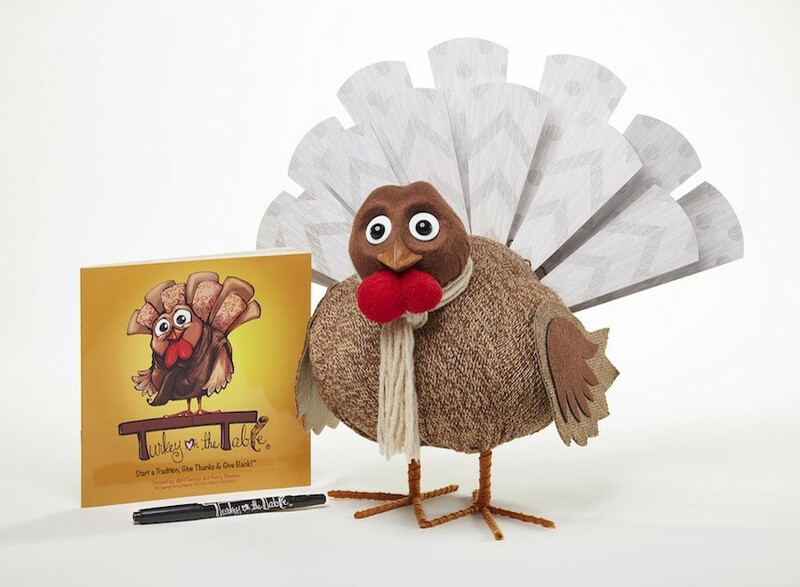 It'll be our new family tradition, and it doesn't hurt that the turkey is super cute! I can't wait to see what sorts of things that they answer because I'm not going to let them use the same answer everyday like they've done before -- in order to get a feather it has to be something new to add. I haven't opened the box yet to preview the story, but I'm sure that it will be great too. I would encourage y'all to get one for yourselves -- you've got a week and a day before it's time to get started -- so order TODAY, and share in the journey with us! Leave a comment below if you've used Turkey on the Table already -- or if you're planning to start it this year! I also have been loving my personal hair color that I get from eSalon - I took a survey that told the colorist some things about my coloring and skin tone, and sent them a photo of myself so that they could custom mix my color for me. They auto-ship it to me every 12 weeks... and all I have to do is take the time to put it on. Easy peasy!